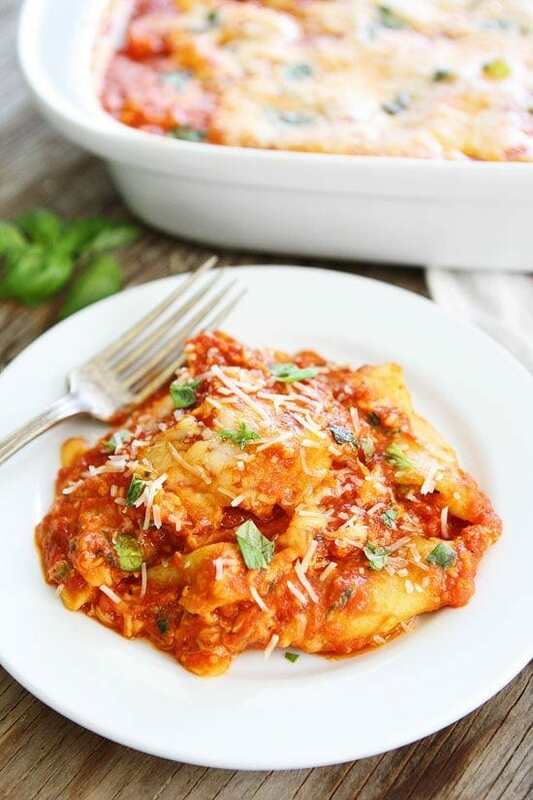 4-Ingredient Ravioli Lasagna-you only need four ingredients to make this lasagna! It is perfect for busy weeknight dinners or easy entertaining! Dinner time is the hardest for me. I am usually exhausted and not in the mood to cook dinner because on most days I have already made a few recipes for the blog. Sometimes those recipes can be dinner, I love those days, but on baking days I have nothing to serve my family for dinner. 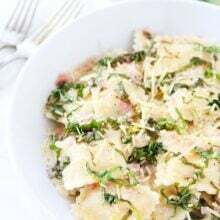 On days when I am tired and not in the mood to cook, I turn to one of our favorites, 4-Ingredient Ravioli Lasagna. You heard me, you only need FOUR ingredients to make this lasagna. How is that possible? Let me tell you my little secret. 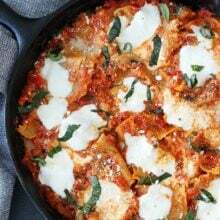 I layer frozen ravioli with marinara sauce and cheese and it tastes just like homemade lasagna! I like to use spinach cheese ravioli, but feel free to use your favorite ravioli. And even better news? You don’t even have to boil the ravioli. Just put the little raviolis in the pan with marinara sauce and cheese and bake! So easy! If I have some of my homemade marinara sauce in the freezer, I use it, if not I use DeLallo’s jarred marinara sauce. Both are great options for this recipe! 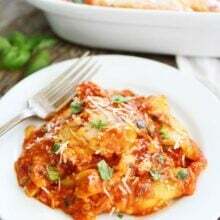 This quick and easy ravioli lasagna is great for busy weeknights or easy entertaining. 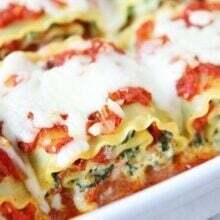 Everyone loves it and will think you slaved over making lasagna all day! If you have time, serve garlic bread on the side. The bread is perfect for soaking up the extra sauce! If you are craving a comforting, filling, and delicious meal after a busy day, make my 4-Ingredient Ravioli Lasagna. It is for sure to hit the spot and requires very little effort. This is one of Caleb and Maxwell’s favorite meals and we hope your family enjoys it too! 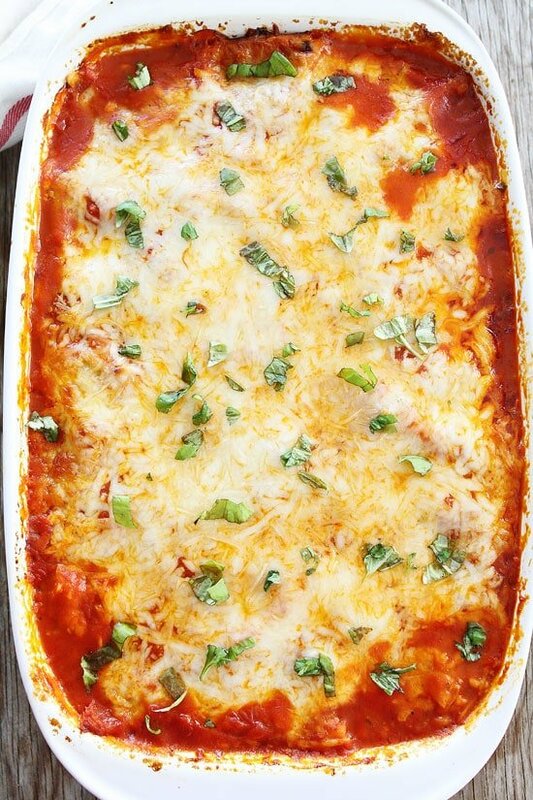 This easy lasagna is one of our favorite meals! It is great for busy weeknights or easy entertaining! Preheat the oven to 400 degrees F. Spray a 9x13 baking dish with cooking spray. Spread half of a jar of marinara sauce evenly across the bottom of the prepared baking dish. Add 1 package of ravioli in an even layer over the sauce. Top with the rest of the half jar of marinara sauce. Sprinkle 3/4 cup of mozzarella cheese and 1/4 cup of Parmesan cheese over the sauce. Add another layer of sauce, ravioli, sauce, mozzarella and Parmesan cheese. Spray a piece of aluminum foil with cooking spray. Cover the dish with aluminum foil, sprayed side down. Bake the lasagna for 30 minutes. Uncover and bake for an additional 15 minutes, or until the cheese is melted and the sauce is bubbly. Remove pan from oven let sit for 5 minutes. Garnish with basil, if desired. Serve warm. Note-You don't have to thaw or cook the ravioli first, just put it in the pan frozen. We like to serve garlic bread on the side! I know what you mean about having the energy of your kids. If I had a quarter of their energy and vibe…I’d be in great shape! 4 ingredients, it doesn’t get any easier than this. Looks so tasty. It’s so hard to get energy to make dinner but when you’ve got this casserole option, I say anything’s possible! This looks fantastic. I serve raviolis on a regular basis but this will put a new twist on it, and looks super easy. Thanks for the recipe! I’m always looking for simple and quick and tasty recipes to make when visiting my grandkids. I’m usually running low on energy by the end of the day after playing with a six year old and one year old twins, and still want to take the chore of cooking dinner away from my daughter-in-law. This one will be made on my next visit. Thanks! Finding time and energy during the week to make a meal that is fresh and healthy can be quite the endeavor. 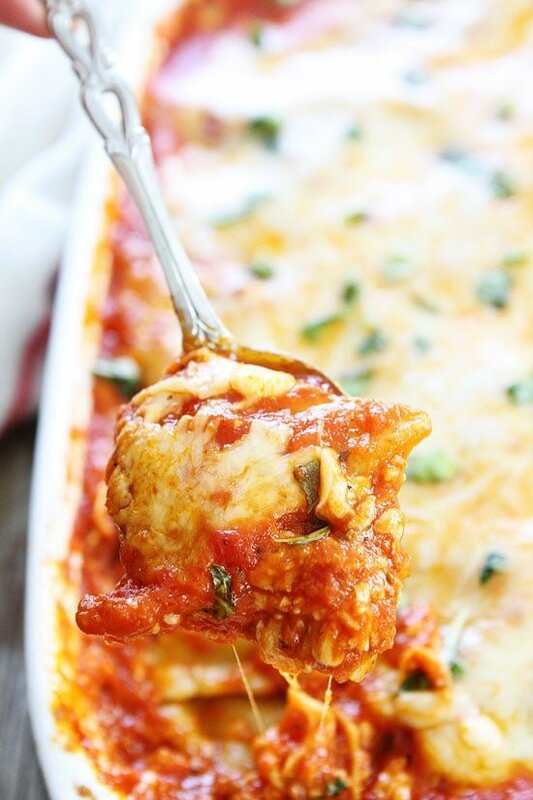 This four ingredient lasagna looks fantastic! I love delicious food, but I’m too lazy to cook sometimes. Guess what we’ll have for dinner tonight? I feel you on those busy, busy days running around lately! I’m all for delicious, cheesy shortcuts when necessary! Love how simple and easy this is to make – perfect weeknight meal for sites! Love simple dinner ideas! This is perfect!!! I’ve been doing more weekly meal prep lately, and this looks like a great addition to the lineup! Cannot believe this takes only four ingredients. My husband is half-Italian and loves Italian food; but, I cannot seem to master that cuisine. Perhaps this dish is a good way to start. Thanks for sharing! It looks great. The perfect meal for back to school!! i pretty much just drooled. Goodness that looks delicious! I will definitely be adding this to my week night rotation. Dinners are the hardest for me to plan too! 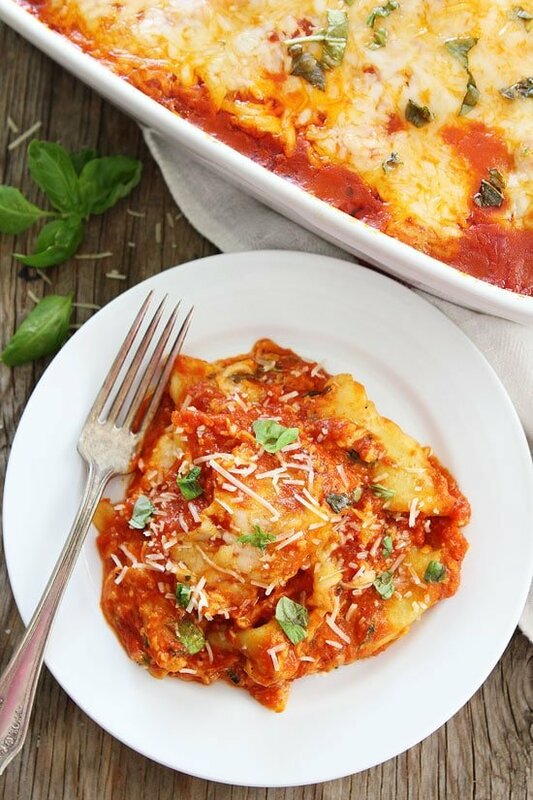 Love that I don’t have to boil the ravioli; it makes for a great one pan meal! Aah craving all this cheesy deliciousness now. What perfect comfort food. So easy and simple. I can’t wait to make this. Thanks! Easy! Bless you… back to school is killing me in the kitchen! Looks great! Will this work with ravioli that is not frozen? Yes! You can use refrigerated ravioli. Was reading through your recipe and came across your use of “unthawed”. FYI: thawing is the process of unfreezing. Would “unthawing” be to refreeze? The correct word would be “thawed”. Perfectly comforting!! And that cheese – I mean, honestly!! Just made this last night! Since I didn’t have spinach-cheese ravioli I added frozen spinach (5 ingredients for me!) and it was SOOO good. I am dreaming about the leftovers!! Yay! 5 ingredients is still easy:) Glad you liked it! So when you say “unthawed” do you mean frozen? Or thawed. Unfrozen? Yes, frozen ravioli. You don’t have to thaw or cook it before adding it to the pan. It will cook in the oven. Made this for dinner tonight using my own sauce. It was wonderful. Hubby and son went in for seconds. Thanks!! Yes, it should be just fine. This is my go-to recipe for Halloween night! We are ‘that house’ on Halloween and I have many helpers. I make two pans, one like the recipe and the other with portobello mushroom ravioli and vegan cheese. Everyone raves how good this is. When I’m feeding vegetarians/ vegans, yours is the first site I visit. Last week, I fed 6 vegans for a few dollars by making the veg chili mac. No one could believe how delicious and satisfying it was. Thank you! Can this be done with fresh ravioli? Can you make ahead and keep in fridge or freezer ? How long do you think?? Yes, you can bake it and keep it in the fridge or freeze it. It will keep in the fridge for up to 5 days and freeze for up to 1-2 months. Looks easy and delicious! 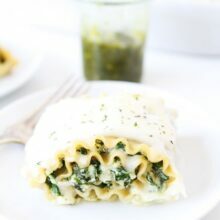 Have you ever added spinach to this recipe? So easy and way good!!! I found frozen ravioli 18-22 oz. and so I used 2 smaller bags of ravioli than the recipe called for. It worked fine! We owe a couple of friends a dinner “on us.” AND we are just beginning to have workmen running piplines for natural gas and installing our natural gas heating/cooling system. SO…your Ravioli Lasagna will be served on the night they come to dinner! A baguette of garlicy french bread will accompany it with Vanilla ice cream for dessert. I am calling them today to set up our dinner. Thank you SO MUCH for this amazingly quick, delicious recipe!! What is your favorite Jar sauce? If you bake and freeze, how long to cook frozen? I made this for a family of 5 who visited my home – we all loved it, and enough leftovers to eat again and again 🙂 I loved that it was so easy to make and used so few ingredients. Since the kids love meat, I added ground turkey (also added 2 cloves of chopped garlic when cooking the meat) to the marinara sauce. I don’t know if it was because of the meat but I did need 2.5 jars of marinara sauce. I would probably also add more mozzarella cheese between the layers. It was a hit, and I’d definitely make it again — very family-friendly. I make this often. One in the oven now. I added a variety of veggies (cauliflower rice, asparagus tips, cut-up mini carrots) that would have been discarded at the end of our rental period.